ONE2ONE Collectibles has posted new info and images for their upcoming Red Spartan bust. 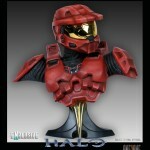 The Halo licensed bust is a 1:2 scale design and is an exclusive to Sideshow Collectibles. It will be available in the first quarter of 2010 at a price of $224.99. You can order it Here. It seems the listing was removed.